Financial Market Vigilante: Oil Supportive of Higher Stocks - For How Long? Focus in the financial market in recent weeks has shifted to the continued Fed easing policy as the announcement was made that there would be no tapering of asset purchases while Ben Bernanke is still at the helm. Stories have also begun to focus on the possibility that Fed quantitative easing policies are creating a stock market bubble. On the credit front, always a critical link to asset bubble creation, the evidence is clear that the market has recovered, with consumer lending in the U.S. now totally over $3.0 Trillion, 12.7% higher than the peak level of almost $2.7T in 2008. Business loan levels are now at the same high water mark reached in 2008. And margin loans against NYSE stocks are now at $400B, slightly above the $380B reached in summer of 2007 when the stock market peaked before the crisis. On a relative basis the U.S. economy is back at the same point in terms of leverage it was 6 years ago, with consumer borrowing leading a charge to higher levels of debt. The big change since 2007 is the size of the Fed balance sheet. The Fed has accumulated U.S. Treasury debt in the amount of $2.2T versus only $800B in 2007. The Fed owns a whopping $1.4T worth of mortgage backed securities, and has increase the size of its balance sheet to almost $4T. The liquidity in the banking system is approaching levels not seen since the 1970s. However, consumer price inflation, which if evident in the market would cause a shift in Fed policy, is subdued. There are many correlated factors which are suppressing consumer prices, the biggest of which is the containment of government spending, tight bank lending and capital requirements, and the magnitude of holdings of U.S. Treasury debt by foreign governments. As a percentage, foreign governments own almost 48% of the outstanding Treasury issuance that is publicly traded. If the U.S. were a corporation, foreign countries as a voting bloc would have a virtual controlling interest. The policy co-ordination between the Fed, Treasury and banking system is critical in keeping the targeted Fed Funds rate at zero without sparking inflation. The QE policy over the past four years has driven invested funds out of Treasuries and MBS securities, and into hard assets such as oil and gold, and also increasingly into stocks. The question is whether the new value for the stock market is a bubble – a pricing level that will deflate if the forces at work which drove the funds into the market is withdrawn; or, is it a new sustainable market high water mark which will continue to rise in the future? When it comes to stock bull market sustainability, one sector that needs to be constantly monitored is the energy market. In my analysis, the crude oil market is a bell-weather, and surprisingly the market is not moving higher given the blazing trail of Fed accommodation. This result is not normal in historical terms. The shockingly accommodative oil market should give stock investors an added degree of confidence – at least until conditions change, which they inevitably do. Between 1974 and 2008, you can clearly see that 5 out of 6 recorded recessions were accompanied by an oil price shock. A price shock occurs when the price of oil rises over 75% in less than 12 months, and it eclipses or at least matches a previous all-time high in constant dollars. On one occasion, during Ronald Reagan’s first term as President, the oil market declined prior to a recession. The decline, however, was after oil reached an extreme interim high dollar per barrel level of over $39.50 in 1980. The manner in which the 1980 oil shock was dealt with both from a fiscal policy and monetary policy standpoint after President Reagan’s election very much dictated the severity of the ensuing recession in 1981-82, and then the eventual economic recovery. For those who need a refresher in financial history, it involved much higher interest rates, lower government spending growth (but not negative), and lower taxes which were financed through borrowing from – you guessed it, foreign governments. 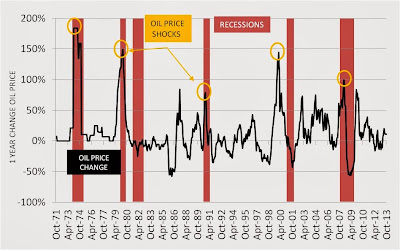 Oil shocks are a very important signal of stock market future direction. Fast upward moves in oil prices are typically indicative of the level of force being applied to the market by foreign trading partners in direct response to dollar weakening policies. Since oil is priced in dollars for trade, if the Federal Reserve is excessively accommodating or there is disagreement within OPEC over the trading dollar price of oil, conflict is almost always exhibited. These conflicts impact the dollar price level of oil, which if the price change is dramatically higher over a short time period, the U.S. economy breaks down due to the taxing effect of the oil shock. One of the most notorious oil shocks in history occurred during the Arab Oil Embargo. The price level set after the Embargo was $10.11 per barrel, about 10 times less than the current day price level of $95 to $100 per barrel. The U.S. price controlled oil market prior to the Embargo was trading at $3.56 per barrel. Incidentally, the U.S. GDP at the point of the Embargo was $1.5T, which is also a little more than 10 times less than the current $16.6T GDP. The GDP relative to oil price relationship is important through time because it indicates the relative purchasing power parity between the U.S. and the Middle Eastern oil nations. The Arab Oil Embargo is an important date for investors to remember because a Treaty was put in place in which the Saudi’s agreed to price oil for trade only in U.S. dollars in exchange for military protection of its oil fields – a linkage that continues to influence trade and foreign policy today, and as a result the stock market. 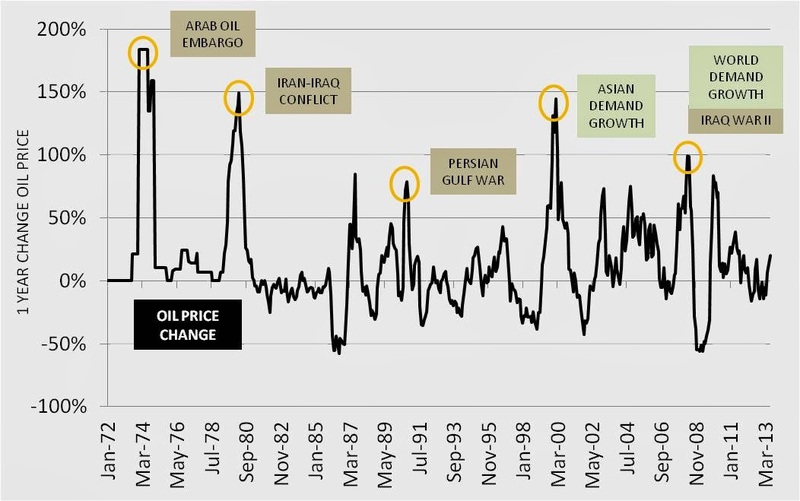 The Iran-Iraq conflict in the late 1970s marked the second major spike in oil prices during the decade. The price change also coincided with the Jimmy Carter administration deregulation of the oil market. Price levels increased from $14 to over $39 per barrel in less than 12 months. The next major price spike was in 1987 in the year leading up to the market flash crash. The actual market price increase, however, did not constitute an oil shock because prices did not come close to eclipsing the 1980 high. Price levels hit $21 per barrel, after being deeply depressed beginning in 1986 by the Saudi Arabian move to grab world market share by increasing production from 2 to 5 million barrels per day. The production move gave the Saudi’s complete say in setting the world oil price at the time, and the oil price run-up in the beginning of 1987 was a brief loss of control. 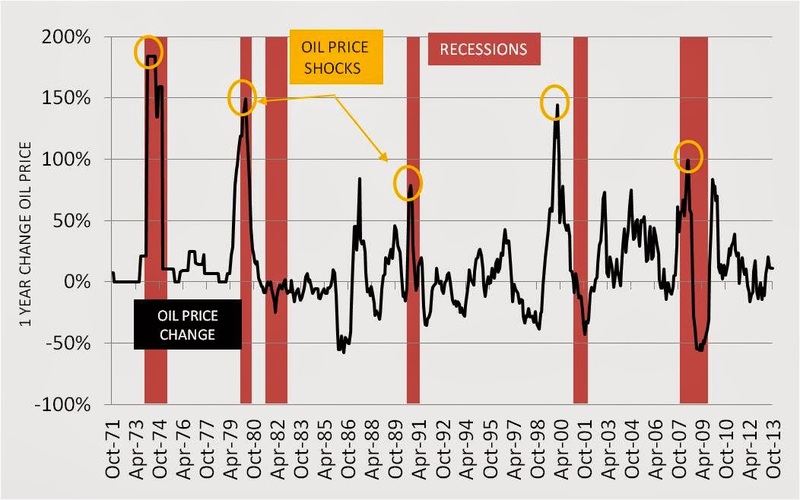 The quick downward reversion of oil prices after the ’87 stock crash led to a quick stock market recovery without a resulting recession being logged. The Kuwait War is the next incidence of conflict which impacted the price of oil and the U.S. economy. The invasion of Kuwait by Iraq required military action by President Bush I. The U.S. intervention was accompanied by Saudi Arabia increasing oil production in an effort to contain the price of oil during the disruptive time period. After the conflict was over, the price of oil remained tranquil until the year 2000. Since 9 / 11 oil prices have had a strong upward bias. The spike in oil prices during the 2008 stock market crisis was historic because it drove price levels to $140 per barrel, 3.5 times above the 1980 high water mark and well over 10 times higher than the price set during the Arab Oil Embargo. Many investors can recall without much trouble the market declines in 2001-03 and the 2008 financial crisis. 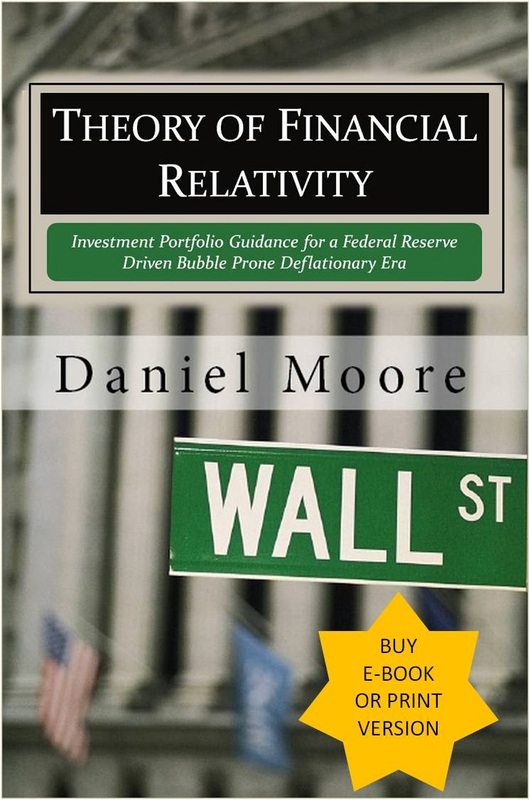 The history books and media journals are replete with references to the dot.com bubble leading up to the eventual market collapse in 2001 through 2003 and the mortgage market meltdown in 2008. These events were hallmark identifiers of each market correction. 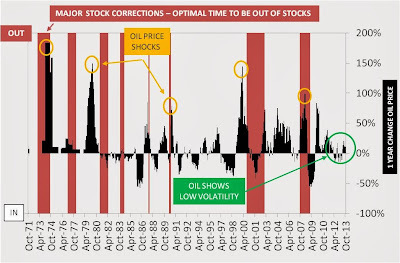 But, the one direct negative market force in both corrections, as well as the majority of all 8 market corrections since 1970 is that the oil market recorded a significant run-up in prices leading up to the market downturn. The evidence that oil price behavior leading up to a market correction is a significant contributing factor can be found in the graph below. In the graph, the market correction time periods are shaded in red and the price change in oil is overlaid shaded in black. The correction time periods shown reflect the months where investors lost money year over year if they were invested in stocks – in some cases up to 20% or more. With perfect foresight, an investor would definitely have chosen not to be invested in stocks during these times. The most significant and longest lasting market declines happened in 1974, 1982, 2001 and 2008. These were also time periods in which the oil market posted the highest increases leading up to the stock market correction. There were 2 times in the 8 observed in which the oil market did not spike leading up to the correction - 1977 and 1983. The 1983 correction was very brief, and stocks quickly regained their upward momentum. During the 1976 time period price controls were in effect which smoothed the oil market price increases exhibited in the U.S. market. The spike in prices happened after the market was deregulated in 1979. What should investors take away from this information? First, as the graph visually shows, price volatility in the oil market is very low in 2013. 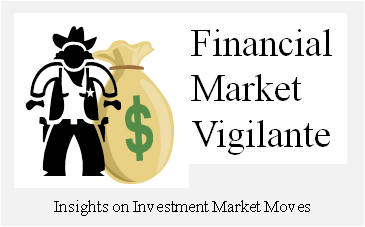 The pricing action is not indicative of an impending major market correction. However, this does not mean that the situation is completely clear of potential obstacles. As was indicated in opening this article, Fed policy is the clear force driving capital flows to bid up stocks in the U.S. market presently. Additionally, there is major exploration activity underway in the U.S. which is making the U.S. more energy independent through time – as well as increasingly and energy exporter. These two factors are seeds for conflict which can up-set the cozy relationship at any time. The Egyptian and Syrian conflicts in 2011 and 2013 are two examples when the crude price tested and briefly broke the $100 per barrel mark, only to be arrested after the conflict was squelched. Eventually the monetary imbalance in the early 1970s was resolved. The U.S. abandoned the gold standard and the value of the dollar dropped by 25%. 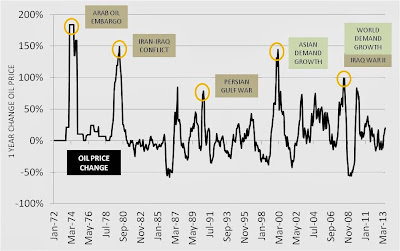 The Arab Oil Embargo was a conflict driven response to move the price of oil in response to a very loose, and unprecedented monetary policy at the time. The seeds are in place for a potentially similar conflict if the current easy money policy begins to flow through from the asset market into the general economy as the Fed continues to monetize the U.S. Debt. When the signs of market imbalance become evident, the impetus for geo-political conflict to drive the oil price higher will likely be from a familiar source – Iran. The biggest risk in the stock market today is the potential recreation of a valuation scenario similar to the 1970s. From 1970 until mid 1971 stock prices saw a brief significant move higher as the oil market was repressed relative to expanding U.S. quantitative easing policies. The U.S. economy was weak, and throwing more money at the problem through monetary actions and then abandoning the gold standard for international trade in August of 1971 inflamed trade tensions beyond repair. The market imbalance led to a forceful response from the region. The Yom Kippur War and the Arab Oil Embargo marked the beginning of an almost 50% decline in stock prices in 1974. On a relative basis the current price of $95 per barrel is in line with levels reached immediately after the Arab Oil Embargo. History reflects that the time period between 1974 and 1980 was not particularly good for stocks, but rather was a period of a second drive upward in oil prices. The entire decade was a wash for stocks. On May of 1971 the S&P500 closed the month at 99 points; in May 1979 it closed the month at 99. And, as most investors recall, interest rates rose substantially – which is the current forecast for the U.S. market over the next several years by a considerable number of market analysts and Federal Reserve Bank Presidents. The possibility for dramatically higher interest rates is the biggest potential parallel between the two points in time. The present docile oil market is very accommodating to the stock market. Until the oil market signals otherwise, it is not time to execute a run for cover drill in stocks. But it is advisable to keep your guard up, and watch for the proper signals in the market. Personally, I am much more of a bull toward accumulating energy based assets and gold, than pursuing investments in the S&P 500 given the potential building scenario. My top recommendation at the present time is British Petroleum (BP). I also recommend a higher percentage of proceeds from the sale of stocks that are not immediately re-invested be used to purchase gold (GLD) (IAU) SGOL) or oil (OIL) (USO) (DBO) ETFs rather than U.S. Treasuries (SHY).